Electroactive polymers are increasingly used in niche actuator and sensor applications demanding large strains as compared to other piezoelectric materials. New applications are emerging in medical devices, haptic actuators, cellular phone cameras, smart fabrics for sensors, digital mechatronics and high strain sensors. 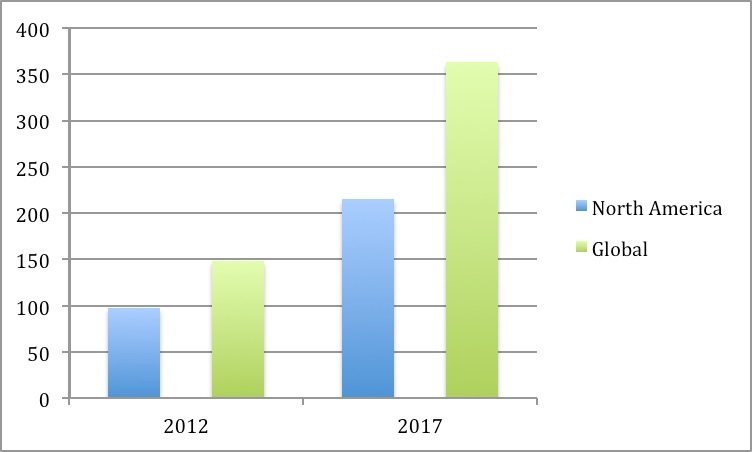 According to a new market research study from Innovative Research and Products (iRAP) titled “Electro-active Polymer Actuators and Sensors – Types, Applications, New Developments, Industry Structure and Global Markets,” the global market for EAP actuators and sensors reached $148 million in 2012. This will increase to $363 million by 2017. North America had about 66% market in 2012, followed by Europe, Japan, and rest of world. The AAGR growth rate is expected to be 17% to 27% for the four regions surveyed for the period 2012 to 2017. An electroactive polymer (EAP) is a polymer that exhibits a mechanical response in response to an electric field, or a polymer that produces energy in response to a mechanical stress. The actuator property of some EAPs has been attractive for a broad range of potential applications. New EAP devices are already replacing some mechanisms that rely on direct or indirect displacement to produce power. An EAP actuator not only is completely different from conventional electromechanical devices, but also separates itself from other high-tech approaches that are based on piezoelectric materials or shape-memory alloys by providing a significantly more power-dense package and, in many instances, a smaller footprint. This study separated markets for EAP devices and products into six application segments – medical devices, haptic actuators, adjustable apertures for cellular phone cameras, smart fabrics, digital mechatronics, and high-strain sensing instruments for construction..
Medical devices had the largest market share in 2012 followed by haptic actuators, adjustable apertures for cellular phones, high strain sensing in construction, smart fabrics, and digital mechatronics. While medical devices will continue to maintain the lead in 2017, that sector will see a modest average annual growth rate (AAGR) of 11.8% for the period. Haptic actuators will see maximum growth at an AAGR of 35% from 2012 to 2017.